United States & Australia are where most visitors come from. 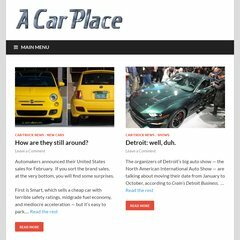 Topics: Cars, Suvs, Minivans, Pickups, and Other Articles. Age: It went live on November 8th 2000, making it over 17 years, 5 months old. The site has about 328 users daily, viewing on average 1.40 pages each. It is hosted by Liquid Web Inc (Michigan, Lansing,) using Apache/2 web server. There are 2 Nameservers, ns.sourcedns.com, and ns1.sourcedns.com. Acarplace.com's server IP number is 50.28.88.49. PING (50.28.88.49) 56(84) bytes of data. A ping to the server is timed at 22.8 ms, and the average page load time is 3148 milliseconds.